带我回家。: Japan Trip Day 02, Universal Studios Japan! Japan Trip Day 02, Universal Studios Japan! - Highlight: One Piece Restaurant, One Piece Premier Show! Since my friend and I were fans of One Piece and USJ had special shows for OP, we HAD to make a reservation for the restaurant and buy tickets for the show - even though it's in full Japanese. Our plan was to sit whatever rides we could > go to our restaurant reservation > continue rides > One Piece premier show. Otaku Alert: There's a Jump Store along Universal City Walk towards USJ so do check it out! One warning: the wait is reallyyyyyyyy long for each ride, we waited about 2 hours for the Spiderman ride. If you're the type who really likes rides (since i totally hate them all), I think it would be wise to invest in a express pass since you're going already anyway, and the queue is wayyyyyyy shorter! The tickets and everything has to be bought online, so you have to go to their Japanese website and look out for the opening period and timing so you can start booking, etc. You will need an account - with a Japan address - you could create one first, or one later when you purchase tickets, doesn't matter. We used the hotel's address since we don't live in Japan. Their current Spring/Summer'14 event page is here: http://www.usj.co.jp/onepiece/5th/spring2014/?area=bann1. It will be good if you have someone who knows a bit bit of Japanese to help you look through those pages and whatnot, since we really struggled when we booked our tickets. And note that the Premier Show is not on everyday, those dates that are white are the days where they have a show so please plan carefully and buy the right tickets! We bought S1 expensive seats and sat at Block J, Row 3 i think! It was DEFINITELY WORTH THE MONEY. Warning, the area on the left A-D gets a lot of special effects and water splashing from what we saw on the show that day so if you're not a very water person, perhaps you can avoid those front seats at those blocks! Seats that are the first few rows on any other blocks will still get splashed by water a little but for the experience, it's totally worth it. You get to see them upclose, and at the end maybe even get a chance to get a hi-five from them! I sat at the aisle so I managed to get a shake with everyone - 'cept Luffy (urgh much sad). The show is in FULL Japanese but don't worry, even as someone who is superrrrrrrrr laoya in Japanese, I understood their plot and story since it's very very simple YET VERY ACTION PACK. Holysheet. Nami is super hot. Ace is SUPER hot. And Luffy is SUPER CUTE. Yup. It's really exciting and really really really worth the money. Lots of stunts, lots of effects - best of all, lots of feels /drowns in tears. Sanji Restaurant is one hell of an experience. It's in 100% Japanese and all the interaction as well so it's better not to freak out at anything while you're there, lol. There's time slots for this so make sure to book a slot you're comfortable with and arrive 10-15mins before the slot to go to the counter to get your orders taken before you head in! At the end of the sessions, it will be photo-taking time! You get your chance to take a photo with the cast, and if you're not sure when to move, don't worry! The staffs will come over and get you to join the queue. Lol. Warning though, I have no idea how our photos on our own camera turned out SUPER blurry, but thank god they sell you their version of the photos anyway (which you are not obliged to purchase) so yeah. It's cool to see all the Characters and they really smile and visit every table! Get your camera ready as they will stop for you to take a photo together, 'cept Luffy who kept running around (in character yo) and I couldn't catch a photo at all. And let me just mention how hot Nami is, again. USJ Tickets Whatnot / Location, etc. We bought tickets locally via a travel agency, PrimeTravel, so we totally skipped the hassle of the whole ticket buying thing, but USJ website has a English guide so check it out before you head there! They usually run low on stocks fast so you gotta call them up and check! 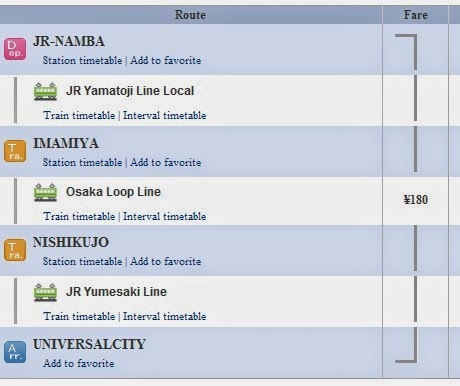 USJ is located at the Universal City Station, pretty far off from on the train stations, so be sure to check Hyperdia for your train details before you set off! It's a SUPER useful reference tbh, and it has helped us a lot during the whole trip. I'm a fan of architecture and whatnot, so tbh the only thing that attracts me in a theme park is their buildings and details in their buildings... I'm really not a ride person... But either way, we took the Spiderman ride - 4D and cool short ride - and then spent the other time walking around instead since time wasn't on our side. If you're a Hello Kitty fan, they have a small shop that sells everything Kitty as well, so bless your wallet. I would recommend that if you have time and like theme park a lot, you can just spend 2 days here and have a great time exploring the place, sit all rides and have a blast! The next day's schedule is Osaka Castle + Cherry Blossom viewing + Umeda! Much excite - one of my favourite days tbh.